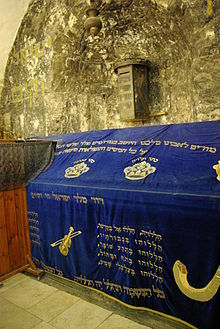 Rabbi Yosef Berger is the rabbi in charge of King David’s Tomb on Mount Zion, and the son of a widely revered Hasidic leader. In remarks to Breaking Israel News, Rabbi Berger cited a medieval rabbinical source that predicted that while the first two temples were built by Israel, the third would be built by the “descendants of Edom,” a phrase that in some later rabbinical literature is a euphemism for the Christian world. This is so that the Christians, and the ancient peoples they have come to represent in rabbinical thought, can make restitution for millennia of wrongdoing toward the Children of Israel. Since Yosef Berger is responsible for the “Tomb of David,” perhaps a few comments on that should be made related to that tomb. I was able to visit this ‘tomb of David’ and the surrounding area on ‘Mt. Zion’ in October 2013 (the photo at the beginning of this post was taken by me). There is an argument on whether or not the actual tomb of David is here (see Church of God on Jerusalem’s Western Hill). Whether it is or not, that area is of historical, religious, and likely prophetic importance. Some have suspected that it could be a site for a Jewish Temple. The Palestinian position is opposed to that as well as the idea it was King David’s tomb. In the future we may find more archaeological evidence. Should it work out, I was told by by a Jewish rabbi named Avraham Goldstein of the Diaspora Yeshiva that he would be willing to take me below the area of ‘Daivd’s tomb’ to presumably show me archaeological evidence of certain Jewish claims to that area if I return again. Now getting to Donald Trump, as far as him physically being a descendant of Edom, that is not the case. But, Donald Trump’s ethnic background does hold some prophetic interest. Donald Trump was born of parents who were basically of Scottish and German descent. His heritage is of interest biblically. The Jews were named for being the descendants of Israel’s son Judah. The Bible shows that there was a split between the supporters of Judah and the other tribes after the death of King Solomon (1 Kings 12:16-20). Most of the descendants of Israel were not Jews. Ten of the tribes were given to a leader named Jeroboam (1 Kings 11:31) and were then known as the kingdom of Israel. The capital of Israel was in the territory of Manasseh and was called Samaria (1 Kings 16:24-29). The Bible sometimes uses the term Samaria when referring to those of Manasseh (Isaiah 9:8-21; Hosea 7:1; 10:1-11; Amos 3:12; 6:1; Obadiah 1:19). Many prophecies in the Bible related to Israel and/or Samaria are not necessarily for, nor limited to, people of Jewish heritage (cf. 1 Kings 16:2; Isaiah 3:12; 9:8-12,21; Hosea 7:1). The Bible also uses the term ‘Samaria’ to distinguish between the descendants of Israel who are Jewish and those descendants of Israel who are not Jewish (cf. Isaiah 10:10-11; Ezekiel 16:1,46, 23:4; Micah 1:1-6). Jewish scholars realize that the Bible shows that Samaria consisted of an ethic mix of Israelites and non-Israelites (Cowley A, Jacobs J, Huxley HM. Samaritans. Jewish Encyclopedia, Volume 10. Funk and Wagnalls, 1996, pp. 669-681). A reading of the Book of Genesis shows that Israel specifically placed his name on the two sons of Joseph named Ephraim and Manasseh (Genesis 48:14-16), neither of which were Jewish. What does any of this have to do with Donald Trump? Well as it turns out, since everyone had to descend from someone, ultimately their progenitors are somewhere listed in the Bible. Hence, biblical writings and prophecies can often be tied to descendants of those progenitors the Bible discusses. Research has found differences between skulls of those of British and German ancestry (Parsons, R.F. Anthropological observations on German prisoners of war. The Journal of the Royal Anthropologic Institute of Great Britain and Ireland, Vol. 49, Jan-Jul 1919, pp. 20-35). Some research has also indicated that many who came to the USA from Germany had different cranial features than many of those that remained in Germany, and hence some have concluded that many with apparent ‘German’ ancestry could instead have been descended from those with the same ancestry as the British (McNair R. America and Britain in Prophecy. Global Church of God, 1996, pp. 29-34; Davidiy, p. 430). Although Donald Trump’s grandfather came to the USA from the German village of Kallstadt, lack of certain cemetery records (Sanderson S. Media frenzy over Donald Trump’s German hometown leaves locals unhappy. Deutsche Welle, November 10, 2016) indicate that his ancestral name bearers could have come from elsewhere, and hence perhaps from regions that more with ‘Joseph’s’ ancestry came from. In the case of Donald Trump, it could be that he is primarily, physically, an Israelite. Whether he is or not, the nation he leads, while an ethnic mixture bringing to mind biblical Samaria, is on the receiving side of the end time prophecies related to Joseph’s son Manasseh. The Bible records the promise from Israel that Ephraim would become a group of nations and that Manasseh would become an important nation on its own. At least one Jewish scholar interpreted certain passages of scripture to mean that Ephraim would rise up first and that Manasseh would rise up later (Davidiy, pp. 384, 445-447). After the rise of the British Empire, some people started to wonder if the British were the people of the covenant promises to Ephraim. A few Christians, Jews, and others began to write about this, as well as the rising up of the U.S. as a major power, in the 19th, 20th, and 21st centuries (Allen, p.315-327; Knox RT. Josephs Land: Ephriam, Or Great Britain, Manasseh Or United States, 1886. Nickels R. History of the Seventh Day Church of God. Giving & Sharing, 1994, pp. 76,142; Armstrong HW. The United States and the British Commonwealth in Prophecy. 1954; McNair R. America and Britain in Prophecy. Global Church of God, 1996, pp. 29-32; Davidiy, pp. 361-450). In the Bible, the descendants of Joseph’s sons (Genesis 49:22-26) were promised prosperity and blessings, which the U.S.A. and its Anglo-Saxon descended allies have enjoyed. Yet, Jesus warned that “to whom much is given” from such “much will be required” (Luke 12:48). And the Bible also warns of curses for those who forsake God’s laws (Deuteronomy 28:15-57). So, blessings and cursings are in prophecies. Without going into all the historical details here (many of which can be found in the article Anglo – America in Prophecy & the Lost Tribes of Israel, available at the www.cogwriter.com website), the connection with Mr. Trump’s heritage is of interest. Various prophecies related to the end-time descendants of Isaac’s sons are included in this book. Essentially the leaders of ancient Ephraim and Manasseh declared that they would rebuild. A few prophecy-watchers have stated that Isaiah 9:9-10 seems to be related to what happened in the USA because of the 9/11/2001 attacks. How could this be related to Donald Trump? I think they have to respond quickly and effectively. They have to figure out who did it and they have to go after these people … Secondarily and less importantly, we have to rebuild in some form in a way that will be just as majestic as the World Trade Center (Donald Trump, September 2001, as later cited by Timm JC. How Donald Trump Talked About 9/11 Attacks Then and Now. NBC, September 9, 2016). At least one prophecy-watcher has believed that American politicians making statements like “we will rebuild” are taking defiance types of positions that Isaiah warned against (The Isaiah 9:10 Judgment’: U.S. in crosshairs. WND, February 20, 2012). Like ancient Ephraim and Manasseh, God was left out of the equation. Since certain prophecies about Samaria appear to be directed towards the USA of the 21st century (e.g. Isaiah 10:4-11; Hosea 7:1-3), and this makes those ties to Isaiah 9 potentially stronger. Presuming that end time Samaria ties with Manasseh AND Isaiah 9:9-10 has an end time fulfillment, then Donald Trump has been one of several leaders to at least partially fulfill this by pridefully boasting that a more majestic rebuilding will occur because of human effort. For more on Samaria, see also Spiritual Samaritans: Old and New. For more prophecies related to Anglo-America, see also Anglo – America in Prophecy & the Lost Tribes of Israel. As far as Rome being the place that Christianity first flourished, that too is in error. Christianity first arose in Judea and then flourished in Asia Minor (see Location of the Early Church: Another Look at Ephesus, Smyrna, and Rome), not Rome. Most Jews and most who profess Christianity do NOT understand the truth about Christian history. For many details, check out the free online book: Continuing History of the Church of God. Furthermore, while the destruction of the temple by the Romans was prophesied in Daniel 9:26, there is no scripture that states that before the Messiah comes that the Romans will rebuild the temple. More on some of Yosef Berger’s scriptural errors can be found in the post Rabbi claims a non-Jew will build ‘third temple’. As far as Donald Trump goes, his Jerusalem embassy move does tie in with prophecy. But Donald Trump is not an Edomite and Edom is NOT about to build a Jewish temple. This entry was posted on Monday, April 2nd, 2018 at 2:00 pm	and is filed under Religious News.